Hello everyone! Winter has become my favorite season of the year, partially due to the cool Texas weather, but also because of the delicious food. 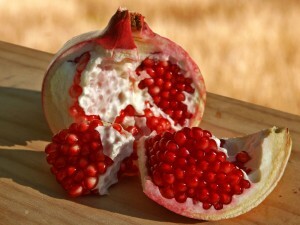 The arrival of colder weather brings with it, the season of one of my favorite fruits, pomegranates! These ancient fruits are among some of the most recognized, valued, delicious and antioxidant rich foods on the planet. Punica Granatum, or pomegranates as they are more commonly known, are native to the middle eastern region once known as Persia (currently known as Iran) through the Himalayas, but have cultivated for millenia in Mediterranean regions of Africa, Europe and Asia as well as India where they are used in Ayurvedic medicine. There are many mentions of this exotic yet healthy fruit throughout history in various cultures including the Old Testament of the Bible, the Quran, and ancient Egyptian and Greek mythologies. The nutritional benefits of this amazing fruit have long been recognized throughout the world, as evidenced by its’ long time use. Consumption of pomegranate juice and arils is attributed to the prevention in hypertensive states through reduced systolic blood pressure. Pomegranates have also been shown to be effective in reducing the risk factors of cardiovascular disease by preventing the oxidation of LDL (low density lipoproteins), in the arteries that leads to atherosclerosis. The main nutrient responsible for these health benefits are polyphenols called Ellagitannins. Ellagitannins, also known as hydrolyzable tannins, scavenge free radicals, which reduces oxidative stress and prevents cell damage. Pomegranates are extremely versatile fruits and can be used in a variety of healthy vegetarian and vegan dishes. They are equally delicious whether they are used in soups, salads or just eaten alone. Use your imagination and enjoy these awesome fruits as much as you can now or else you’ll have to wait until next year! Pomegranates are fascinating. I’d love them if I knew how to eat them and what to do with them. The juice is a lovely color and I like the taste.. but eating them? Not sure how this is best done.